Household final consumption expenditure (formerly private consumption) is the market value of all goods and services, including durable products (such as cars, washing machines, and home computers), purchased by households. It excludes purchases of dwellings but includes imputed rent for owner-occupied dwellings. It also includes payments and fees to governments to obtain permits and licenses. Here, household consumption expenditure includes the expenditures of nonprofit institutions serving households, even when reported separately by the country. If you rethink about the developments, which have taken place just in the most recent years - especially in the Emerging Market countries, like China, Vietnam, India, Indonesia and so on - it should not be that hard to imagine, what the next 10 to 15 years could bring to those countries regarding economic prosperity given the available workforce, especially in India with its huge population and favourable demographics. In this context I would like to give a very short "quick n dirty" refresher on Economics 101, if you need some. You might read a lot about GDP (Gross Domestic Product) in the newspaper or hear about it on Radio, TV, etc. but what does this indicator really stand for? Well, mainly GDP is commonly used as an indicator of the economic health of a country, as well as a gauge of a country's standard of living. But of course this measure (GDP) is still imperfect - in fact - especially now in the 21st century FAR from being perfect. For instance it emphasizes economic output without considering economic well-being - GDP growth alone cannot measure a nation's development or its citizens' well-being. As an example, a nation may be experiencing rapid GDP growth, but this may impose significant cost to society in terms of environmental impact and increase in income disparity. Still, we can use it somehow to compare apples to apples (country per country) but not taking into account other important factors like efficient Governance, etc. 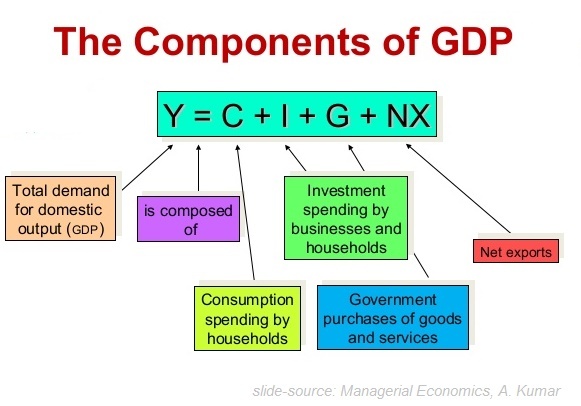 Here another short definition on GDP: GDP [...] is the sum of gross value added by all resident producers in the economy plus any product taxes and minus any subsidies not included in the value of the products. It is calculated without making deductions for depreciation of fabricated assets or for depletion and degradation of natural resources. Given the information above it should not be that surprising, that the global economy nowadays relies much more on the "efficient interplay" between the global economic forces Europe, Asia and USA. Furthermore, Emerging-Countries like Brazil are gaining positive momentum again in the more recent quarters! The economic path for the next decade should be easier to understand if one takes the information above and makes ones own conclusions about the interplay between the continents and how this global interconnection can hopefully lead to more efficient colloborations and competitive, but still fair frameworks within the next decade.